Today's post is about the most important chemical reaction for polymers that is NOT a polymerization reaction. The reaction is the moisture-cure silanization of glass and other silica surfaces, a pre-treatment that is given to fiberglass  so that it will interact favorably with the polymers used in making fiberglass composites. Any time I've needed to increase adhesion to glass, I've been successful in incorporating similar type silanes into the coating formulation, an approach that often will work well enough to justify skipping the extra time and processing of a pre-treatment so I've never actually used this reaction as a pre-treatment. At the same time however, if you've ever looked through the trade literature of the major silicone suppliers, you can't help but to have not had it drilled through your head. As a result, there is little point in me repeating that well-established mechanism execpt for one little detail: a 2011 research article  suggests that the standard mechanism for the cure as actually incorrect. The researchers looked at differences in the FTIR spectra (specifically the asymmetric methylene stretch at ~2923 cm-1) when a trimethoxysilane and a triisopropoxysilane were coated repeatedly on a glass surface. With the trimethoxy compound, the spectra showed that additional coating layers resulted in additional coverage, where as with the latter silane - a far bulkier compound with three isopropoxy groups - additional coats did not increase coverage. This result is not possible with the classic mechanism which suggests that the distance between the added central silicon atoms will be the same regardless of the size of the alkoxy groups. 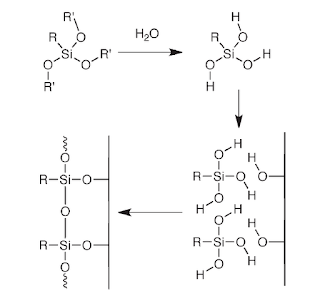 The proposed mechanism however, can account for the bulkiness of the alkoxy groups and how they can prevent the reaction of additional coating layers with the substrate. 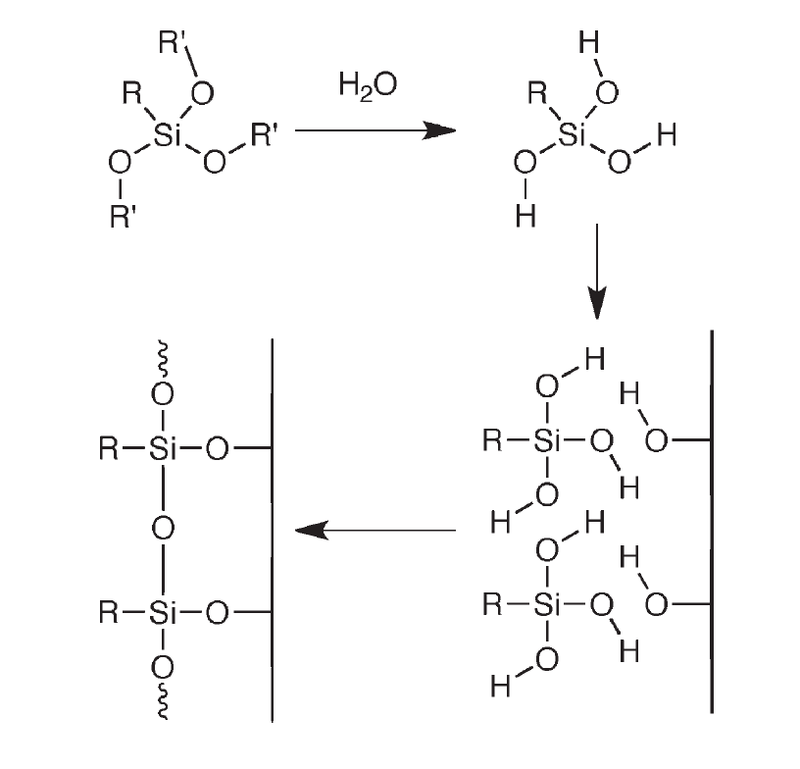 I find it interesting that the proposed mechanism results in three Si-O-substrate bridges from a single silane molecule. 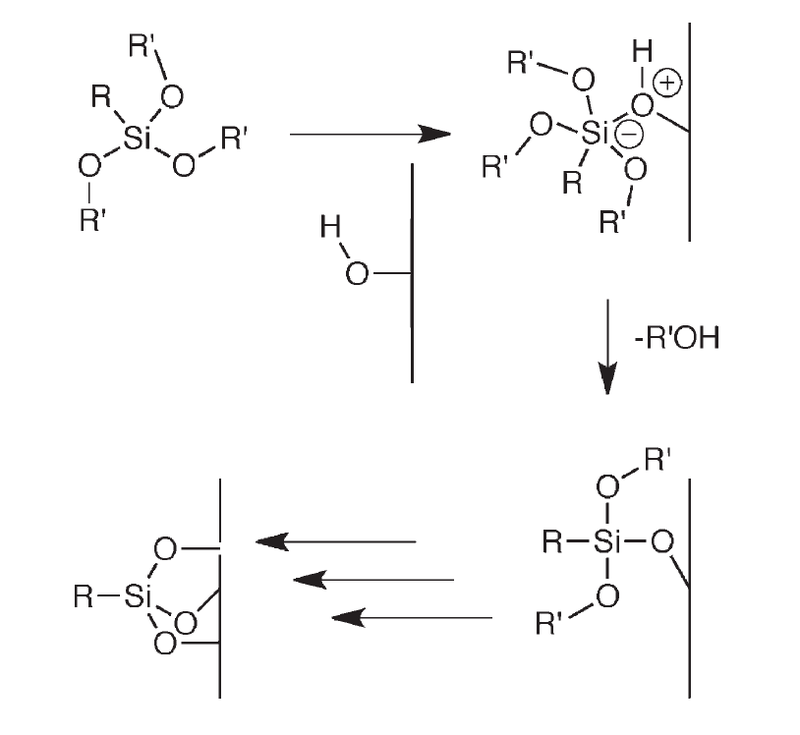 I would be most curious to see how this mechanism plays out with a slightly different set of silanes - dipodal silanes. These a molecules that have two groups of trialkoxy silanes on the same molecule - hence the name (dipodal = "two feet"). 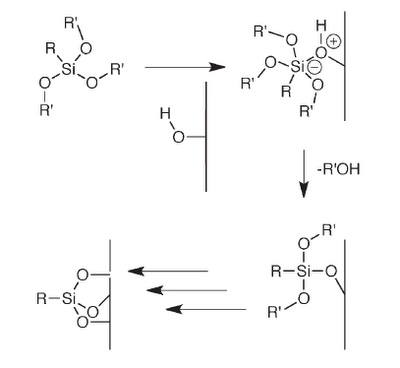 Dipodal silanes are available with different spacers between the silanes, as well as different alkoxy groups. With these additional variables, it should be possible to further test the proposed mechanism. Just a note on symantics: fiberglass is the generic term while Fiberglas (with a capital F, and just 1 s) is the trademarked name for Owens-Corning's version of this. Free access until 12/31/2012, although you may have to register with the RSC. The tri-functional vs. bifunctional vs. shielded mono silanization has been extensively researched to develop HPLC columns. Take a look at Waters' XTerra vs. Symmetry columns. Other manufacturers have similar products. I really appreciate this post. I have been looking all over for this! Thank goodness I found it on Bing. Heya this is a superb post. I website possessor I think the articles here is really superb , thankyou for your efforts. My spouse and i felt so lucky Ervin could complete his basic research with the ideas he was given through your site.